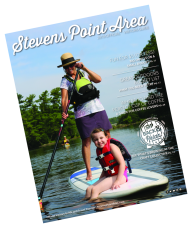 Learn more about the Stevens Point Area in the news by visiting our the Media center here. Do you have a passion for the hospitality and tourism industry and a desire to be a storyteller for the Stevens Point Area? Learn about available positions here. Have a capital project or special project that would add to the Tourism Industry in the Stevens Point Area? Learn more about the Stevens Point Area Tourism Development Grant and apply here. Do you have a business in the Stevens Point Area, and are looking for ways to connect to visitors in the region and to the local hospitality industry? Learn more about the Partner in Tourism program here. Current partners can be sure visitors have access to the most current information as they make their travel plans by utilizing the Partner Extranet to check for sales leads, update listings, add events, create special offers and more. The Stevens Point Area Convention & Visitors Bureau is affiliated with international, regional, statewide and local organizations. Learn more here. Whether you are planning a vacation, a meeting, a sports event, a group outing or just want to say hi, we&apos;d love to hear from you. Learn how you can connect with our office here.